$1 for One. 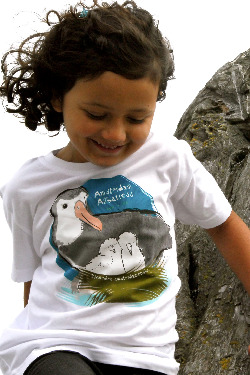 Support the extraordinary work of BirdLife International and its Save the Albatross Campaign by purchasing a SpeeZees Amsterdam Albatross t-shirt in Beluga White. Made with love from 100% GOTS certified organic cotton. Region: The Amsterdam Albatross is a huge albatross which breeds only on Amsterdam Island in the southern Indian Ocean, one of the most remote islands in the world. Habitat: During the breeding season, birds forage both around Amsterdam Island and up to 2,200 km away in subtropical waters. Greatest threats to its continuation: The island on which this Amsterdam Albatross breeds has undergone a significant decline in habitat condition due to the introduction of feral cats and cattle. These seabirds are also threatened at sea by the practice of long-line fishing. Because there is only one breeding location, they are also especially vulnerable to disease. Amsterdam Albatrosses gathering on Amsterdam Island, courtesy of Dominique Filippi. Amsterdam Albatross pair-bonds are lifelong. The Amsterdam Albatross is a huge albatross [4.8–8 kg (11–18 lb), and 107–122 cm (42–48 in) long with a wingspan of 280–340 cm (110–130 in)]. This marine, highly pelagic (applies to sea birds that come to land only to breed, and that spend the major part of their lives out at sea) albatross spends the majority of its life out at sea, coming to land only to breed. The Amsterdam Albatross breeds only on Amsterdam Island, an island in the southern Indian Ocean, at an altitude of between 500–600 m (1,600–2,000 ft) above sea level on the Plateau des Tourbières in an area of peat bog that has an ample covering of moss. Amsterdam Albatrosses breed biennially in open marshy ground. Both parents incubate the egg in alternate stints that last for about a week, with the chick hatching after 80 days. The chick is brooded for a month, and overall takes 230 days to fledge. At first it is fed by its parents every three days, with the feeding frequency reducing as it approaches fledging. At the peak of weight gain the chick weighs more than its parents, but then loses weight as the extra reserves are used to grow feathers. Having fledged the young bird stays at sea for around five years before returning to the colony, and begins breeding a few years later. The Amsterdam Albatross produces a stomach oil made up of wax esters and triglycerides that is used against predators as well as an energy rich food source for chicks and for the adults during their long flights. Satellite tracking has recently shown that adult birds in non-breeding years range westward from Amsterdam Island to the coast of eastern South Africa and eastward from this island to the south of western Australia - 3,000 kms from each continent - with possible sightings being reported from New Zealand. Support the extraordinary work of by purchasing a SpeeZees Amsterdam Albatross t-shirt in Beluga White. Made with love from 100% GOTS certified organic cotton. Check out this beautiful courtship dance between Amsterdam Albatrosses on the Plateau des Tourbières on Amsterdam Island. The next film clip is the trailer for the new documentarty MIDWAY, the story of the Laysan albatrosses on Midway island, an atoll roughly equidistant between North America and Asia, and one of the most remote places on Earth - in many ways a parallel to Amsterdam Island in the southern hemisphere. MIDWAY is a powerful visual journey into the heart of an astonishingly symbolic environmental tragedy. Finding solutions to ridding our oceans of plastic from the Great Pacific Garbage Patch is one of the most important challenges of our time. Warning: This trailer is devastating. Only for the strong of heart.